Brittany has worked with a full array of people, ranging anywhere from young adolescents to the elderly, and from competitive athletes to new mothers. Brittany has played soccer at the college level, and still enjoys playing the sport today. She also enjoys running, volleyball, any track sport, and weightlifting. Because of Brittany’s experiences through sport, she can understand the need to reach a goal and difficulties associated with achieving it. 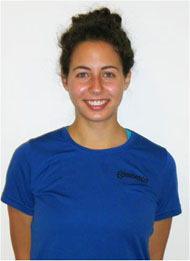 She has worked with hockey players, soccer players and marathon runners, all to improve their performance. Brittany has also helped the average person achieve healthier living and increase functional mobility. Brittany’s training philosophy is that if you are committed to a goal, you can achieve it. Currently, Brittany teaches group Circuit Training and TRX Boot camp classes.